Go outside on a "rock collecting mission" to find rocks and pebbles that will make this turtle's hard shell. If you would like to make a smaller version just use a dessert size paper plate. 1. Paint your paper plate brown (acrylic paint was used on the pictured turtle, but washable finger paints will work as well). 2. Using the green paper, cut out the turtle's head and tail. Using a coffee mug, trace out 2 circles and cut each circle in half to make the turtle's legs. Once the paint is dry, glue on all of your turtle's parts. Don't forget to draw on the turtle's eyes! 3. Make your turtle's shell strong by gluing on small rocks and pebbles. Congratulations! You just finished your turtle, enjoy! 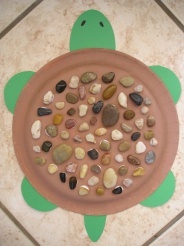 Click here to find more Reptile Crafts like the Turtle Mosaic.